Super Seedy Granola! 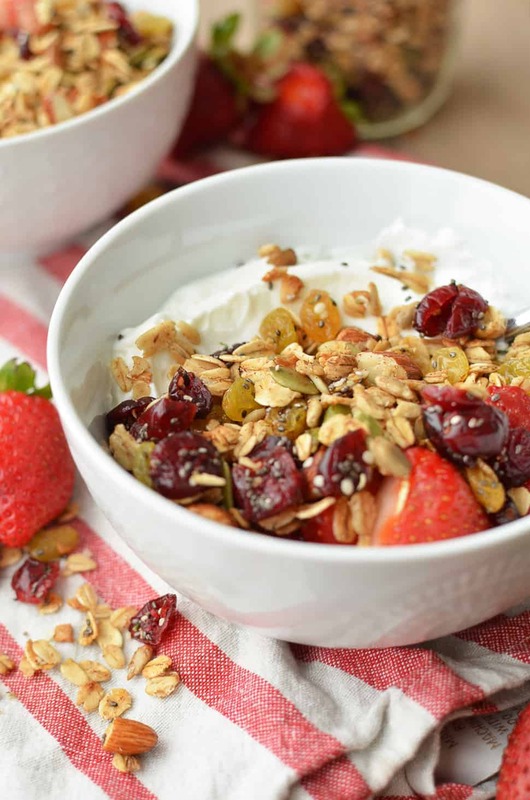 With new research showing that people who snack on nuts live 2-3 years longer, this granola is packed with both seeds and nuts for maximum nutrition. A must try! Sometimes I make really random diet goals for myself. These ideas can pop out of nowhere or they are fueled by reading other blogs, articles, or books. One thing that I’ve been focusing on lately is incorporating more healthy fats into my diet, particularly in the form of nuts and seeds. My usual intake is by new means low in fat, quite the opposite actually. I’m not a high-fat propagandist but I don’t shy away from garnishing my meals with avocados, nuts, extra virgin olive oil and occasionally cheese. Quality is just as important as quantity, especially when it comes to oils and fats. 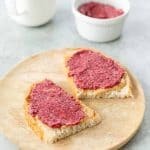 While I think the recent paleo trend has a lot of flawed nutrition claims, I do like that it’s helped steer the food conversation toward minimally processed, whole-foods and away from the highly processed, artificially sweetened, low-fat food that many of us, including myself, grew up with. The thing about nutrition is that it’s a science, not a philosophy. I’ve been reading into more of the Blue Zone Diet research lately, and it’s comforting to know that after the latest diet trends have faded, the core recommendations will still be there: Eat whole foods, mostly plants. Blue Zones are areas of the world where people not only live the longest, but also have the highest numbers of people living well over 100. Researchers then examined their habits and compared them across regions. For the most part, those who live in Blue Zones follow a high-vegetarian, high-carb diet. Roughly 65% of their diet is whole grains, beans and starchy tubers and the snack of choice is nuts. 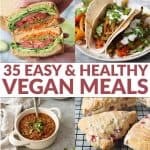 Claims like this make me even more inspired to keeping getting the word out: carbs aren’t the enemy, especially in the form of whole grains & beans. It’s also made me reexamine my own diet and challenge myself to incorporate more nuts and seeds where I can. I wanted to re-do my usual granola recipe to feature more pepitas, chia seeds, and hemp seeds. 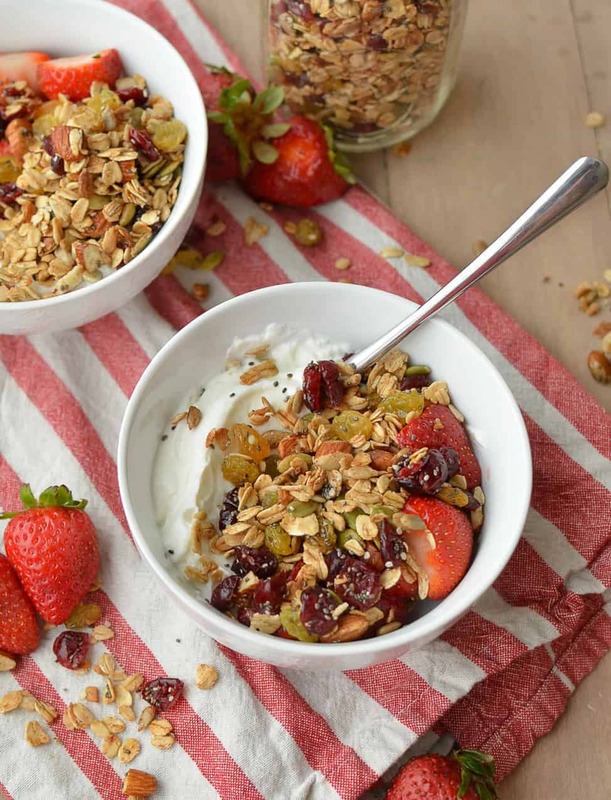 Crunchy, slightly sweet, and hearty, this granola is perfect piled on yogurt, mixed into cereal or eaten by the fistful. 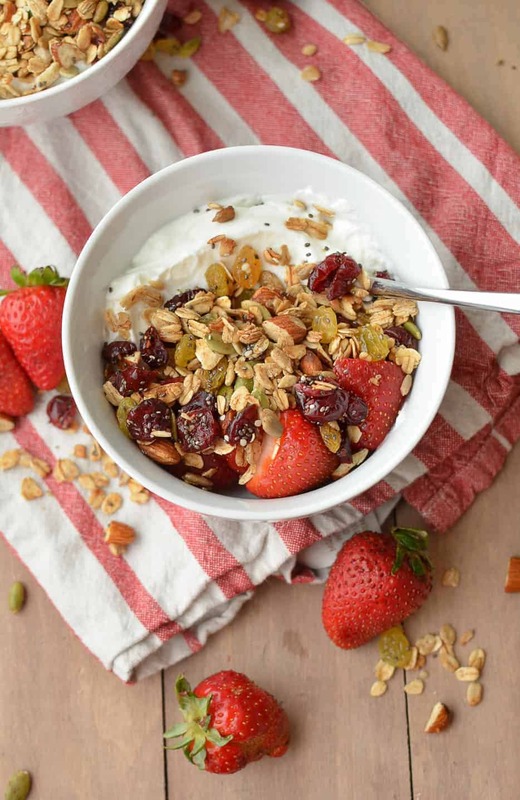 There’s no judgement when it comes to how you prefer your seedy granola, just enjoy it. After I make a big batch, I love spreading the love. 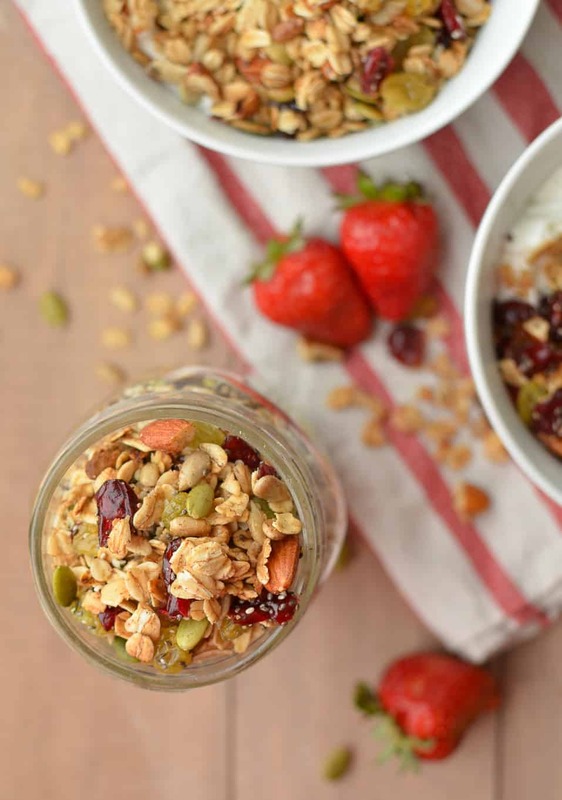 All all the foods I gift, jars of granola are hands down my favorite. There is something so neighborly about heading door to door with a fresh batch of granola. Maybe this is how I’ll bring the Blue Zones to St. Louis? One jar of granola at a time. Preheat oven to 300. 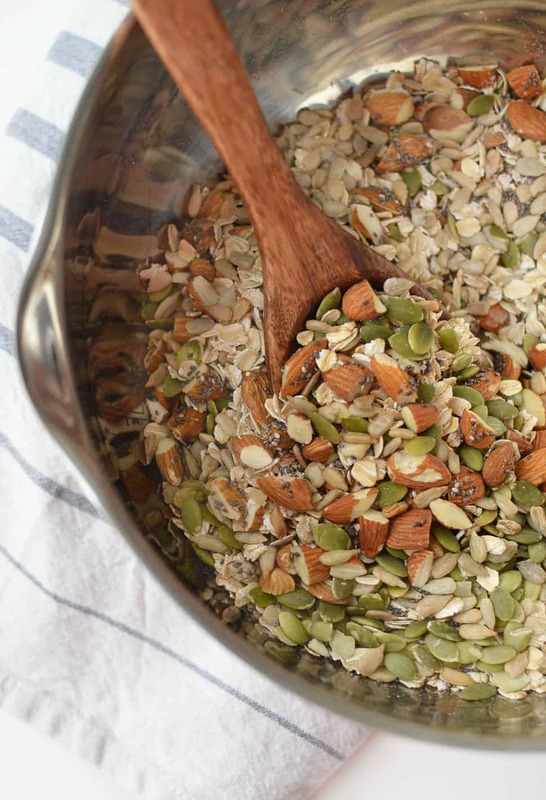 Place oats, seeds, almonds, pepitas, chia seeds in a large bowl. In a smaller bowl, whisk together the maple syrup, coconut oil, vanilla, cinnamon and salt. Pour over the granola and mix very well. Place the granola mixture in a single layer on a baking sheet (may have to use more than one sheet)and bake for 35-40 minutes until golden brown. Toss the minute every 10-15 minutes to prevent hot spots and burning. Remove from oven and lightly toss with dried fruit right onto the sheet pans. Let cool completely (this is how the clusters form) and store in airtight container for up to 2 weeks. 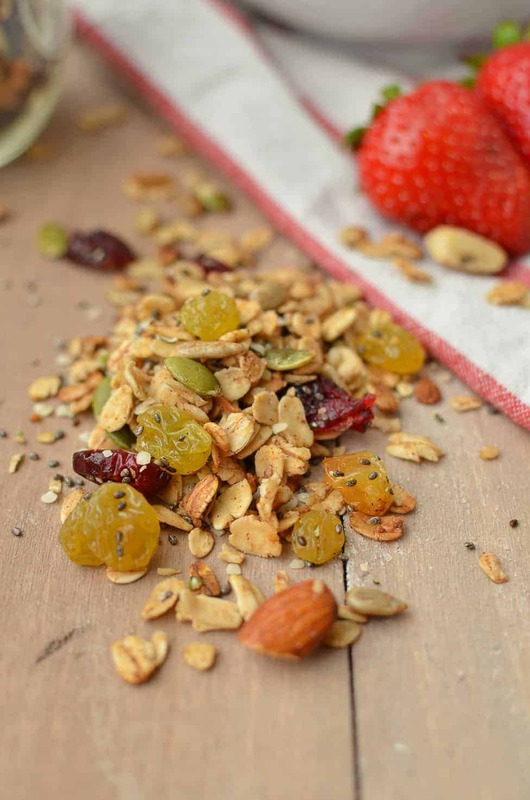 Homemade granola packed with seeds is my favorite recipe ever lately…so versatile and so addictive! I usually make a big batch every week – mostly because it disappears so quickly. Beautiful pictures, Alex! 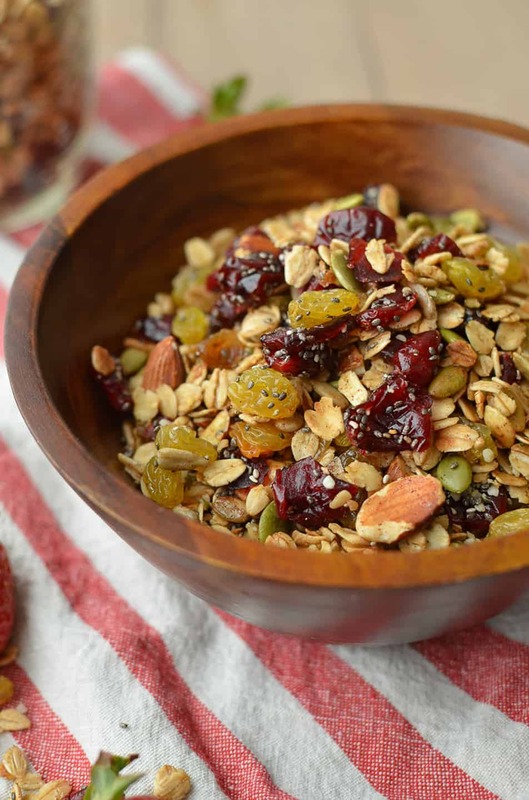 I love adding all kinds of nuts, seeds, and dried fruit to my granola too. From multi-grain bread to zakkokumai, I simply adore tons of varied seeds in a single dish! 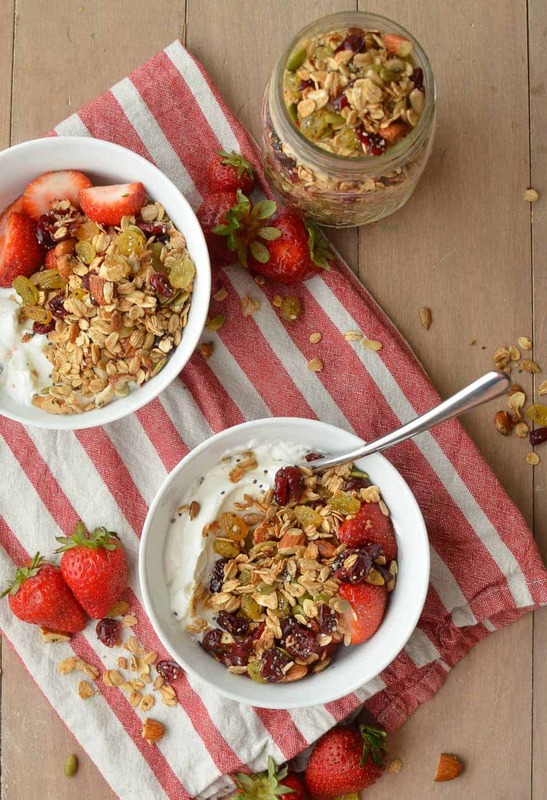 This granola looks fantastic; a hundred times better than anything you’d find prepared and packaged in a cardboard box.